Vitto with the strip. He'll go to the line with 3.4 seconds left and UW up 64-62. Turnover Villanova. Ethan Happ brings the defense! Hart with a turnover with 3. 4 left. Happ with great defense. Cats are on stopped on a drive to the basket. Down 64-62 with two UW free throws ahead. 3.4 seconds on the clock. Vitto brown gets the strip. What a combo from the two. Brown to the line with 3.4 seconds left. Vitto hits the first free throw! First free throw by the Badgers is good. Wildcats down 65-62. Brown makes the first. Villanova uses its final timeout. Apropos they can seal this with a FT.
'Nova calls TO to try and ice Vitto on the back end of a one-and-one. Badgers up three with 3.4 to play. 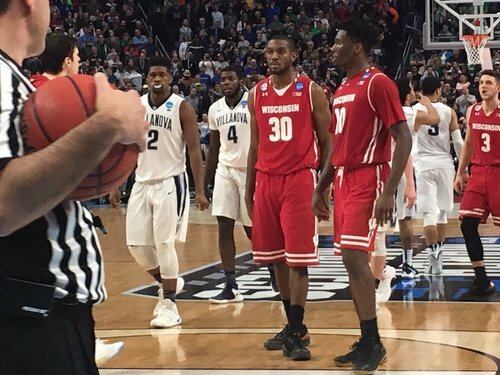 Final score: Wisconsin 65 Villanova 62. UW wins 65-62. The #Badgers are headed to the Sweet 16 for the sixth time in seven seasons. FINAL: No.8 Wisconsin 65, No.1 Villanova 62. Badgers headed to the Sweet 16 for the fourth consecutive year. Wow! #Badgers wipe out 57-50 deficit in final 5:07 and take down No. 1 Villanova, 65-62, Incredible. BADGERS WIN!!! On to the Sweet Sixteen! 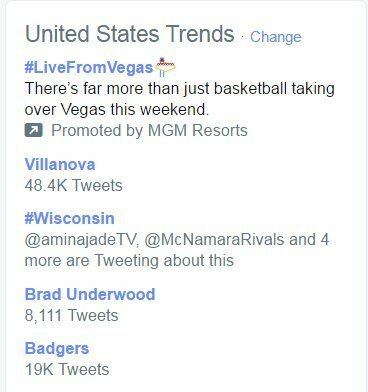 THAT was an insult to Villanova. Vitto gets a game ball - came up big early and late. After a rough season, I'm glad he got a moment. UW ends the game with a 15-5 run two days after a 10-1 closing kick vs. Virginia Tech. 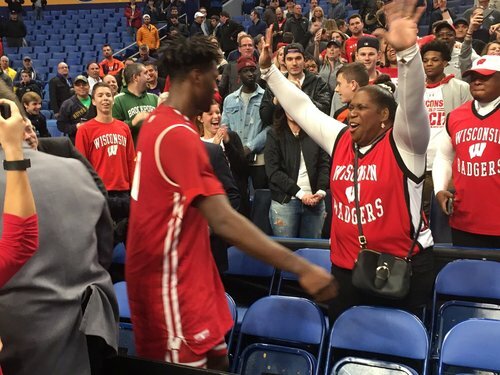 FINAL SCORING: Nigel Hayes 19, Koenig 17, Happ 12, Brown 10, Showalter 4, Iverson 3. Badgers shot 53.1 percent, 52 percent in 2nd half. Wisconsin gets the Virginia-Florida winner in NYC in the S16. Anyone else kinda want Tony Bennett? yeah, we're kind of a big deal right now. 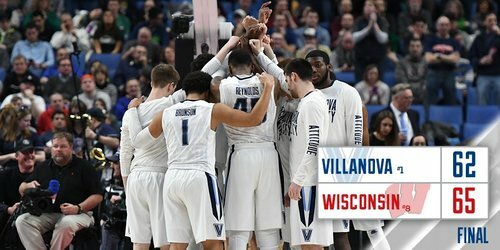 Wisconsin outscored Villanova 15-5 over the final 5:31 of the game.